(Host) A lot of people in the Northeast are worried about paying for heat this winter. Some think wood might be the answer to high oil and natural gas prices. But although it’s cheaper, burning wood may not be that good for the environment. As part of a collaboration with Northeast public radio stations, Amy Quinton from New Hampshire Public Radio reports. (Quinton) The Stove Shoppe in Windham, New Hampshire, borders Massachusetts — drawing in customers from both states who are hungry for wood-burning stoves. (Naylor) "I got a store completely full of people, we’re absolutely just jam packed, it’s been absolutely insane"
(Quinton) Sales manager Ken Naylor says business hasn’t been this good since the oil crunch in the 1970s. (Naylor) "Just in the month of July we sold more stoves than we did in all of 2006 and 2007 combined – in just one month." (Quinton) Naylor’s clients aren’t just rural residents anymore, but people like Rebecca and Chris Gregoire from suburban Chelmsford, Massachusetts. Like many New Englanders, they say they’re fed up with the price of oil. (Chris Gregoire) "We basically tallied up our yearly heating bills and all of a sudden we learned that we had almost a 100-percent increase. It definitely makes you reflect on what sort of other options are out there." (Quinton) This year the Gregoires are choosing wood – and so are a lot of other people. Whether it’s a wood stove, a wood pellet stove or a wood furnace, some retailers in New England can’t guarantee customers will have them by winter. And the demand for wood is also skyrocketing. 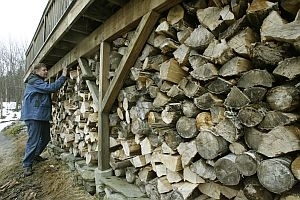 Jasen Stock with the New Hampshire Timberland Owners Association says he’s seen firewood prices double or even triple. (Quinton) Besides the price, some people are turning to wood because they think its cleaner. But that’s not necessarily the case. (Rector) "Residential wood smoke has come up on the radar screen in a big way because it is the largest source of fine particulate matter in the U.S."
(Quinton) That’s Lisa Rector, the Senior Policy Analyst for Northeast States for Coordinated Air Use Management, or NESCAUM. She says those tiny particles that make up smoke and soot can pass through closed doors and windows and cause increased rates of cardiac disease, asthma, and shortened life span. And there’s no uniform approach to regulating what spews into the air. The Environmental Protection Agency sets emission standards for new wood stoves — but not older ones. Outdoor wood furnaces are by far the dirtiest -they have no pollution filter and are not regulated by the EPA. That’s led some Northeastern states to set their own regulations. Wood pellet stoves are designed to burn cleaner but Rector says manufacturers don’t have to inform consumers about efficiency. (Rector) “Some are clean, some are dirty, it’s very hard to tell a difference from a consumer standpoint." (Quinton) But Rector says that doesn’t mean people should stop burning wood – but consumers need to be careful how they burn it. (Quinton) And while wood is renewable, that doesn’t mean burning it will reduce global warming. To be carbon neutral, a tree that’s cut down has to be replaced with another that stores an equal amount of carbon. Keeping that in balance is almost as challenging as finding affordable energy. (Host outro) Northeast environmental reporting is made possible, in part, by a grant from United Technologies. The coverage is part of NPR’s Local News Initiative.